Here at Earth Block International we have done your homework for you, through trial and error. We know what machines work and don’t work, why some blocks are inferior to others and who is making the best block available today. There are several manufacturers of pressed earth machines. Some use side-press technology while others press from the top or the bottom. The machines vary radically in size, rate of block production and cost. Carefully shopping for a pressed earth machine is important, not only due to the aforementioned considerations, but also to ensure a machine selection appropriate to the geography of the region involved. A machine that is too large, top heavy, or that lacks adequate road clearance would not be a desirable choice for rough terrain. 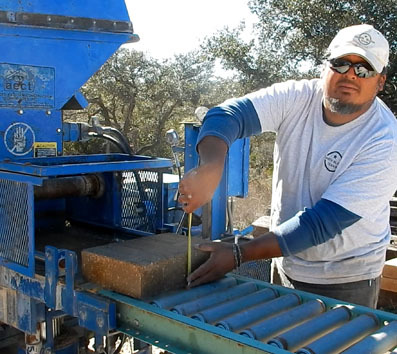 Perhaps the most important ingredient in pressed block manufacturing is the soil. Sufficient clay content is critical. Not enough clay can lead to an inferior block that will not pass a pressure test. On the other hand, excessive clay content will lead to an unacceptable degree of cracking in the dried blocks. 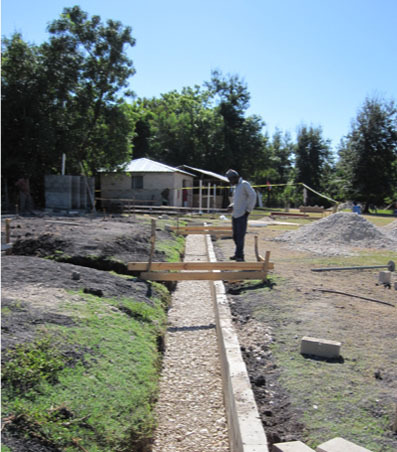 Before the blocks are made, the soil is usually mixed with a stabilizer such as lime. The stabilizer helps make the block strong and weather resistant. 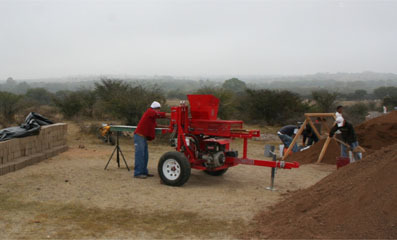 The soil mixture is loaded into the hopper of the properly selected block machine. With most machines, Earth Block dimensions can be adjusted depending on design and architectural factors. 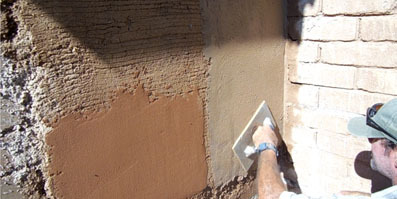 Most adobe blocks, whether sun-dried or machine-pressed, stabilized or unstabilized, should be cured prior to placement in the wall. Some codes suggest two to three weeks of cure time, however, different soil and weather conditions will alter the drying time. Curing is important because the blocks get stronger and slightly shrink as they dry. Shrinkage and settling are typical in earthen structures and these unwanted effects can be minimized with curing. Earth Block, however, can be used almost immediately. Earth Blocks can be stored for unlimited periods of time (unstabilized must be kept dry). The blocks must be sufficiently elevated off the ground to prevent moisture from wicking up into the stack. If poly/plastic covering is used, it is worth noting that the black variety better withstands sun damage than the clear. The foundation is one of the most critical parts of any building. 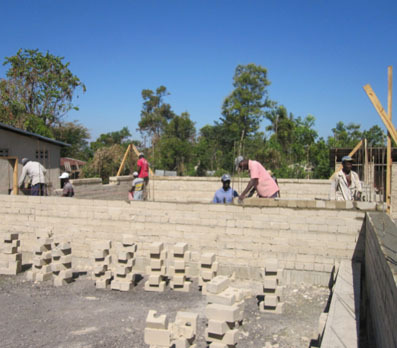 The best foundation for an Earth Block building is made of steel reinforced concrete. Earth Blocks, or adobes, should almost NEVER be used as part of a foundation, as earthen blocks are susceptible to severe damage in the face of long-term moisture exposure. Foundations typically consist of two major components – footings and stem walls. Both the footing and the stem wall should be reinforced with rebar. Flooring options depend upon the climate, region, material availability and client preference. Although not all flooring systems have structural ramifications, some do provide lateral support at the floor or ground level. Floors may be of wood, earth, concrete, or other material. When pouring a concrete slab for a floor, care should be taken to thicken the slab wherever an interior earthen wall will be located. With a footing/foundation in place, walls can literally go up in one day with no delays for cement mortar to dry or settlement time issues. Earth Blocks are structural blocks, not filler blocks, and are used for floors, walls, cisterns and other structural components. Their design flexibility allows for any building style, from traditional to contemporary, multi-angled or rounded walls, freestanding keystone arches… the design of a building is limited only by the imagination. Door and window “bucks” are simply wooden boxes made from two-by-fours or two-by-sixes. These are set in the wall during block stacking both to delineate the space for the door or window and to provide attachment. There are many approaches to stacking adobe blocks, however, for the best end-product and speed, story poles are highly recommended. Story poles can be constructed of wood or angle iron and are placed vertically at the corners of the building by attachment to the foundation. Angle braces fastened at the top of the story pole and then secured either to the ground outside or to the foundation will keep the story pole plumb. Ideally, pressed Earth Blocks should be fastened together with exactly the same material from which they are made. If the blocks are 100% earth, then the slurry should be that same earth sifted through a quarter-inch screen and mixed with water to a milkshake consistency. The slurry should be applied to the lower course of blocks as thinly as possible, but with complete coverage. It should never be allowed to become dry before placing the next course of Earth Blocks, as the molecular adhesion sought is dependent upon all the surfaces remaining moist. The structural integrity of an adobe building is greatly influenced by the methods used to lay the blocks. Along with the use of wet slurry, staggered joints and wall weaving are of the utmost importance. Where walls come together to form a corner they should be woven with alternating patterns as each course enters the corner. This same weaving technique is crucial where interior walls meet exterior walls. Exterior plaster is almost always necessary on pressed block buildings. If the blocks are all earth, a protective covering is critical. Traditional three-coat stucco is the most common. Some finish coats include synthetic (acrylic) stucco paint. If the blocks are completely stabilized (waterproofed), it is possible to leave them exposed. Interior earth plasters are a desirable finish because they are inexpensive, non-toxic, aesthetically pleasing, and breathable.